Size: 7.9" x 3.9" x 0.85"
We noticed rumors in the graphing calculator community about an upcoming product from Texas Instruments around June 2006 and it was obvious that they not refer to the PET project. It took about 6 month and the first images of the TI-Nspire CAS+ appeared in different forums on the Internet. These prototypes of the later TI-Nspire CAS were used in different field tests all over the world and some of them found their way to eBay auctions. We acquired the featured TI-Nspire CAS+ "DVT1, serial number 000150" on an eBay auction in Germany without any notice of the special character (and value) of the unit. A great find for the Datamath Calculator Museum, probably disappointing for the regular customer! Learn more about the Five Engineering Stages. Architecture: Dismantling this early TI-Nspire CAS+ prototype reveals an internal design somewhere between the PLT-SHH1 prototype based on the sophisticated POMAP1509E and the ZEVIO architecture of the final TI-Nspire CAS. Processor: The OMAP™ processor of the TI-Nspire CAS+ prototype is labeled TI-OMAP NP31AZZG. We assume that this tiny chip is actually a System-on-Chip based on the OMAP5912 architecture from Texas Instruments hosting a ARM9 32-bit RISC processor clocked at 78 MHz and a TMS320C55xx Digital Signal Processor core. The NOR Flash-ROM was invented by Toshiba in 1984 and found its way immediately as a replacement of the more expensive ROM (NRE mask costs) and EEPROM (device costs) memory. The NOR Flash-ROM's use an address and data bus to allow the random access to any memory location. Main disadvantages of the NOR Flash-ROM compared to the NAND Flash-ROM are the higher costs, larger housings and slower write speeds. The disassembled TI-Nspire CAS+ (Manufactured June 2006) makes use of one SST 39VF400A, manufactured by Silicon Storage Technology, Inc. with a 256k*16 organization. Please keep in mind that even the TI-89 Titanium used 2M*16 Flash-ROM. The NAND Flash-ROM architecture was introduced by Toshiba in 1989 and is based on pages of typically 512 to 2048 Bytes and blocks of typical 32 or 64 pages. While programming is performed on a page basis, erasure can only be performed on a block basis. NAND Flash-ROM's requires bad block management to be performed by device driver software or hardware. Due to the missing address bus the NAND Flash-ROM chip doesn't allow random access to the individual memory positions and therefore it can't be used for program memory of a microprocessor. Typical use of the NAND Flash-ROM memory is file based mass-memory storage such as memory cards. The disassembled TI-Nspire CAS+ makes use of one ST NAND256W3A NAND Flash-ROM with 32M Bytes size compared with 8M Bytes CMOS NAND EEPROM located in the PLT-SHH1 prototype. SDRAM is the abbreviation of synchronous dynamic random access memory and is used as program and data memory for microprocessor systems. Each bit of data in a SDRAM is stored in separate capacitor on the integrated circuit. Since these capacitors leak charge, the information eventually fades unless the capacitor charge is refreshed periodically. Because of this refresh requirement, it is a dynamic memory as opposed to SRAM and other static memory. Its advantage over SRAM is its structural simplicity: only one transistor and a capacitor are required per bit, compared to six transistors in SRAM. This allows SDRAM to reach very high density at low cost. Since SDRAM loses its data when the power supply is removed, it is accompanied usually by a NOR Flash memory. During power-up of the system the program content of the NOR Flash is simply copied into the SDRAM and executed from there. We assume that the TI-Nspire uses the SDRAM as workspace for user data but stores changes on them into the NAND Flash memory. The disassembled TI-Nspire CAS+ makes use of one Infinion HYB18L256160 SDRAM with 16M*16 size compared with 8M*16 SDRAM located in the PLT-SHH1 prototype. Please notice that all three memory chips are almost identical with the parts located in the released TI-Nspire CAS with the April 2007 manufacturing date. The only difference is the supply voltage, it was lowered from 3.3 volts to 1.8 volts. Display: The TI-Nspire CAS+ uses a high-contrast display with a resolution of 240 * 320 pixels, a huge improvement over the TI-89 Titanium with 100 * 160 pixels or the Voyage 200 with 128 * 240 pixels. The large 16-level grey-scale display includes a novel split screen capability with up to 4 views. The driver circuit of the LC-Display is compromised of 2 column driver and one row driver manufactured by Novatek, Taiwan. We located a NT7702H row driver as bare chip mounted on a flexible piece of circuit board attached between the display and a PCB and two unknown column drivers. Information provided by Xavier Andréani. 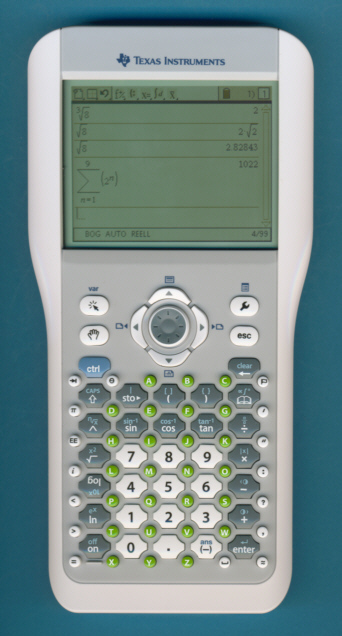 Since the TI-Nspire CAS+ lacks a QWERTY keyboard it is permitted (as of September 27, 2007) for use on SAT, PSAT and AP exams. Calculators with computer algebra system (CAS) functionality are not allowed on ACT exams. Prior to the Nspire CAS's final release, a number of prototype models were developed for evaluation by educational establishments around the world. These units came in numerous color schemes and were all denoted "Nspire CAS+". Some of these prototype CAS+ units were leaked and put up for sale on sites like eBay. As they do not contain final firmware and are not upgradable, TI advises against their purchase. © Joerg Woerner, August 2, 2009. No reprints without written permission.